Waterford FC fell to a 3-2 defeat at the hands of Derry City at the Ryan McBride Brandywell Stadium on Monday night. Ciaron Harkin gave the home side a 13th-minute opener before Shane Duggan’s expertly taken penalty kick levelled. The Blues twice put through their own net before Cory Galvin’s late goal ended up as a just a consolation. Alan Reynolds’ side could have opened the scoring when a fine through ball from Scott Twine picked out the run of Zack Elbouzedi but his shot was saved by Derry keeper Peter Cherrie from deep inside the penalty area. 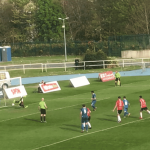 And Derry took the lead less than 60 seconds later when Junior Ogedi-Uzokwe turned provider for Ciaron Harkin on the edge of the penalty area and he gave Blues keeper Matthew Connor no chance finding the bottom right-hand corner. Bastien Héry forced Peter Cherrie into a fine save before Connor produced an excellent save from David Parkhouse inside the area. The Blues equalising goal arrived on 59 minutes. Derry defender Darren Cole fouled Bastien Héry and referee Neil Doyle pointed to the spot. Shane Duggan sent Cherrie the wrong way to level the game 1-1. The home side went back in front with 15 minutes to go with Patrick McClean’s cross from the left struck Rory Feely and ended up in the back of the net. A second own goal looked put the tie to bed nine minutes later when David Parkhouse and Ciaron Harkin linked up with the latter’s strike hitting Blues defender Georgie Poynton in a packed penalty area and finding the back of the net. 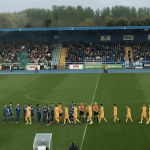 Cory Galvin ensured it was a nervy finish with the goal of the game on 88 minutes when the tricky midfielder picked up possession of the ball 35-yards and unleashed a dipping right-footed shot that gave Cherrie no chance…but the Blues couldn’t find a late equaliser and left with nothing.